But that’s the common response when I tell people I just visited Heaven on Earth: Salt Spring Island. 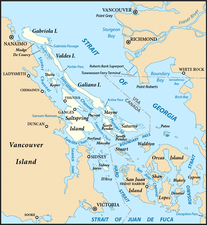 For the geographically challenged, Salt Spring Island is the largest of the Gulf Islands located between Vancouver and Vancouver Island in British Columbia, Canada. A two-hour flight from San Francisco to Victoria, B.C., and a 20-minute ferry ride (perhaps the most civilized of all transport options) gets you there. But as you set foot on this magical isle, you might as well be thousands of miles from civilization. Sight: Sweeping vistas of lush green forests, fertile farmland, and gleaming waters are at every turn of the island’s country roads. Sailboats dot Ganges Harbour, orchards and farms paint the pastoral landscape, and at night, the stars light up the sky like a planetarium. You’ll want to burn these sights into your memory, or even better, take home a painting by local artist Carol Evans who beautifully captures the island in her spectacular watercolor paintings. Smell: Salt Spring is nature’s equivalent of a hyperbolic chamber. The air is clean, crisp and invigorating, as if it's extra oxygen-infused. Local artisans, many of whom you can visit on a self-guided tour of 26 local studios, live off the fertile farmland and share their bounty in self-service honor kiosks outside their farms. So depending on your route, you may be treated to smells of freshly baked bread and pies, freshly roasted coffee, or aromatic fields of lavender. Taste: Everything seems to taste better on Salt Spring Island. 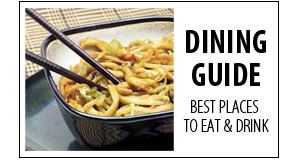 Maybe it’s because “farm to table” typically involves a few hundred yards. Or maybe it’s because processed, fast foods are non-existent. Salt Spring residents live off of the land. Sound: If you ever wondered where Sharper Image sources soothing sounds for its ambient noise machines, think Salt Spring Island. Chirping birds, croaking frogs, babbling brooks, and gently lapping waves are constants. Rarely do you hear cars, and you certainly won’t hear angry motorists honking their horns; there's not a single traffic light on the island. The only gridlock you’ll encounter is the 11 car line-up for the ferry. So where do you stay to rediscover your senses on Salt Spring? If you’re seeking luxury, the award-winning Relais & Chateaux Hastings House Country House Hotel is a must. 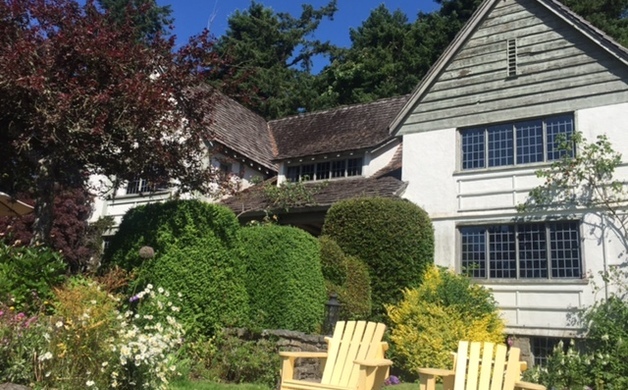 This 18-room resort, fashioned to resemble a British country manor, overlooks beautiful Ganges Harbour. 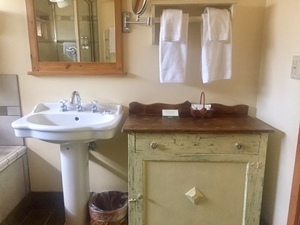 Rooms are spacious and charming with luxurious amenities such as plush bedding and robes, soaking tubs, Saltspring Soapworks bath products, and heated towel racks. Most have views of the waterfront. Guests enjoy complimentary afternoon tea and pastries, and a delicious English breakfast is included (preceded each morning by the delivery of warm, freshly baked muffins to your doorstep.) A hallmark of the Relais & Chateaux designation is delicious food, and Hastings House has perhaps the finest restaurant on the island. Famous for Salt Spring Island lamb, the freshest prawns and halibut, a vast selection of vegetables, fruit, and spices grown directly on property, and one of the most extensive wine lists in Western Canada, the kitchen is led by Chef Kauer who prides himself on offering a dining experience unparalleled in the Southern Gulf Islands. The hotel also boasts a small spa situated on property in a cedar-clad barn. Wellspring Spa (consistently ranked in the top 100 spas of North America) is a tranquil oasis surrounded by walking tails, sculpture, eagles, owls and stunning gardens. 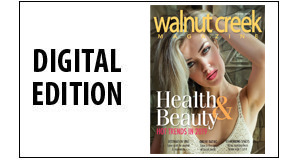 Each therapist at this little boutique spa offers expert advice, skin care recommendations, and lifestyle guidance. 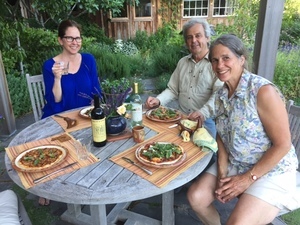 If you’re looking for a more casual Salt Spring experience, try a B&B, or befriend one of the many local farmers who occasionally open their homes to visitors. I was fortunate to stay at Brookwood Farm, an amazing retreat owned by Richard and Edith Stevenson. Tired of the hustle and bustle of Vancouver, they retired to this 5-acre sanctuary located at the south end of the island. Brookwood Farm is home to virtually every fruit and vegetable imaginable. 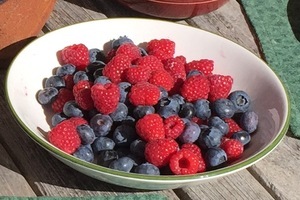 Meals were incredible and featured items freshly harvested from the garden: fresh pesto, roasted beets with chicken, hand-thrown vegetable pizza, housemade blueberry and ginger scones, and fresh hazelnut bars. The amenities, including nightly turn down service that featured homemade chocolate toffee, were enough to make me consider relocating to Salt Spring on a permanent basis. 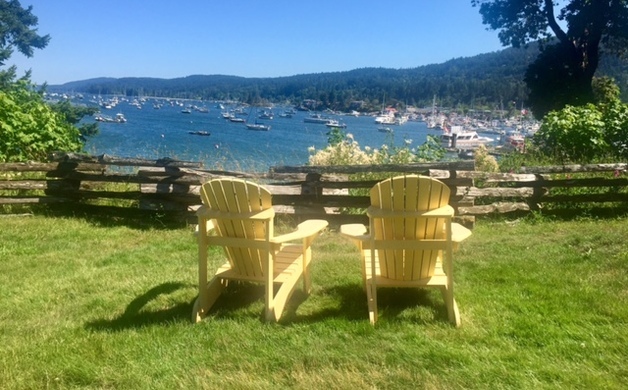 Come to your senses - make the short trip to Salt Spring Island and discover how life is meant to be lived.